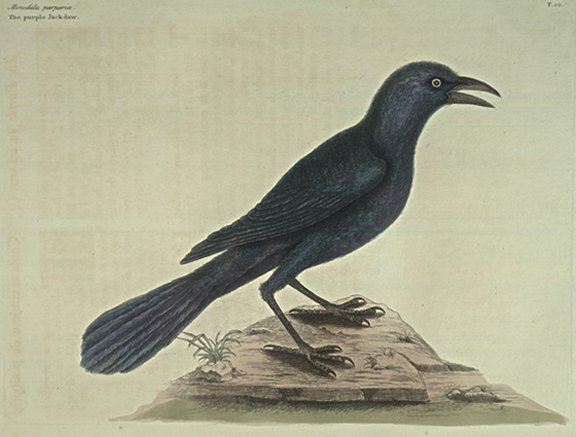 This is not so big by one third part as the common Jack-Daw, weighing six ounces: the Bill black; the Eyes gray; the Tail long, the Middle-feathers longest, the rest gradually shorter. At a distance they seem all black, but at a nearer view, they appear purple, particularly the Head and Neck has most lustre: The Hen is all over brown, the Wing, Back and Tail being darkest. They make their Nest on the branches of trees in all parts of the country, but most in remote and unfrequented places; from whence in Autumn, after a vast increase, they assemble together, and come amongst the Inhabitants in such numbers that they sometimes darken the air, and are seen in continued flights for miles together, making great devastation of grain where they light. In winter they flock to barn-doors. They have a rank smell; their flesh is course, black, and is seldom eat.